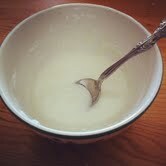 1/4 cup corn starch/arrowroot powder (for smooth and dry)~ I used organic. 4-5 drops essential oil (optional for scent). I used peppermint~ a fun scent.